Latino Art Beat President Don Rossi Nuccio joined officials of District of Columbia Mayor Adrian M. Fenty’s Office, officials from The Mayor’s Office on Latino Affairs (OLA), representatives of District of Columbia Public Schools, academic partners Columbia College Chicago and Robert Morris University and arts education leaders to honor Latino Art Beat competition winners from high schools around the USA. A formal awards ceremony took place on October 15th at District of Columbia Public Schools corporate headquarters at 2:00 pm where all the regional Latino Art Beat 1st Place winners from Chicago, Houston, Los Angeles, Miami and Washington, D.C. were officially honored. A special scholarship presentation was made to these very talented regional competition winners, whose artwork was displayed at this milestone event. 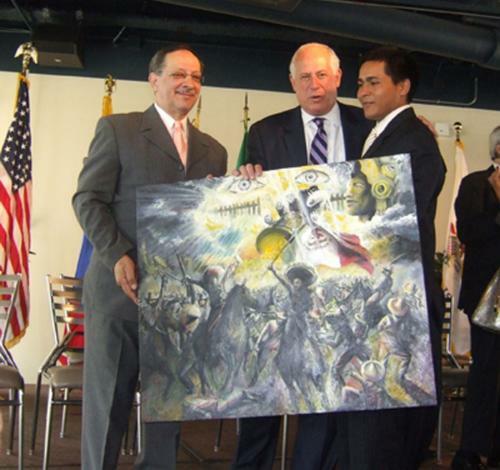 To date Latino Art Beat has awarded over $3 million in scholarships to its competition winners. A reception in collaboration with DCPS, Latin American Youth Center and OLA, for all the regional 2010 Washington, D.C. / Latino Art Beat competition winners took place the evening before on October 14th at 6:00 pm at the Mexican Cultural Institute, 2829 16th Street, Washington, D.C. 20009.